DOES THIS PLACE LOOK HAUNTED TO YOU? Well, Cat and I were out here at the mill site when we ran into an old guy that said he'd been visiting this site since the early 70's. He said he knew some of the history of the place and that he liked to spend most of his nights during the summer here. But, he NEVER spent the night on Saturdays. Both mine and Cat's interests were piqued, so we asked, why not on Saturdays? We shouldn't have asked!!!! The old geezer said that the "ghost" wouldn't let him. HUH? He said that the ghost physically threw him off the property! HELLO! Cat and I didn't hang around too much longer after that! But we did go back the next Saturday! We camped out on the property behind the mill, made a nice fire, ate some good food and waited. And waited. And waited! Nothing! 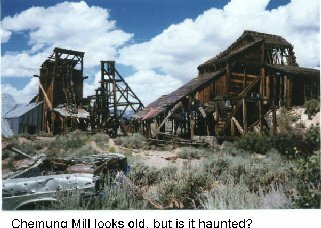 We even cruised around in the mill hoping to see something but the "ghost" obviously didnt mind us cruising around, because he didnt evict us! We had a completley uneventful night, and slept just fine! So, anyone else camped here and have any stories to share? If so, please let me and Cat know, we'd LOVE to hear about it! 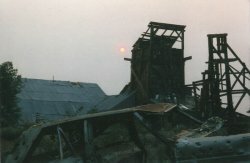 The Chemung mine was discovered and named by Stephen Kavanaugh around 1900. Chemung was named after his hometown in Illinois and the mine produced more than a million dollars worth of ore in its lifetime. 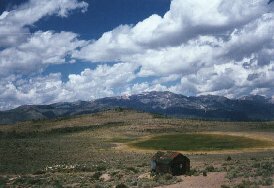 Also, Kavanaugh ridge, southwest of Chemung in the Sierras, where the ghost town Dunderberg is located (also on this website), was named after Stephen Kavanaugh where he drove a gold vein tunnel nearby. However, its our guess that the buildings still standing here are from the 30's or 40's. There are several older foundations, possibly dating back to the turn on the century, that can be found in the aspen trees on the south side of the meadow.